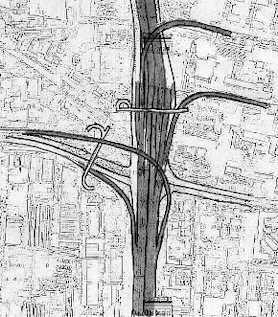 J19 is where local roads from three directions, plus the M8 all funnel onto the Kingston Bridge across the Clyde. 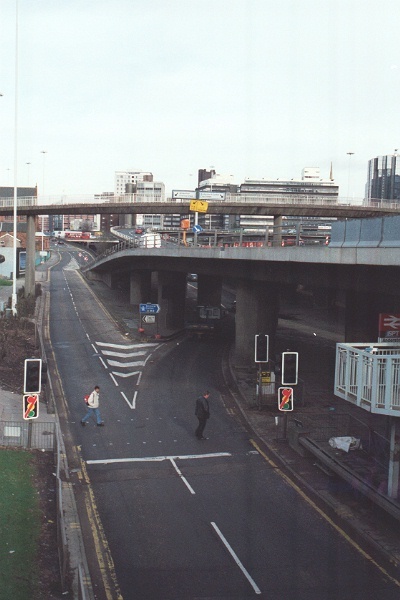 The northern section of the junction consists of ramps joining the M8 with the A804, plus a link between the motorway and the city centre, to the east. View north along the A804, with the motorway on the right. 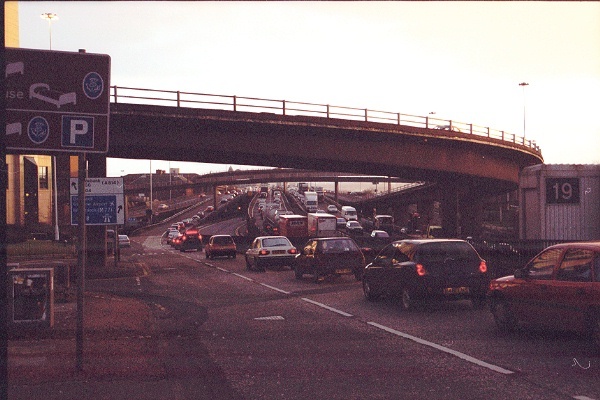 An entry from the A804 leads on to the northbound M8, passing under the northbound J18 exits, before climbing to join the motorway beyond. 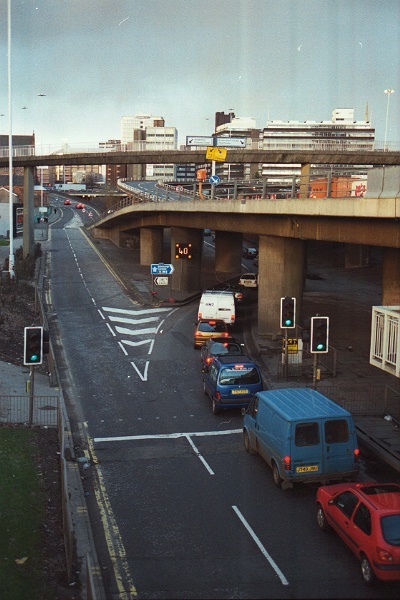 The J18 exit ramp splits, one half descending to the A804 and the other climbing and curving eastwards towards the city centre. Traffic which joined at J20 must exit here, with a choice of routes. The only exit from the mainline becomes the right hand lane climbing out to the city centre. The 'bridge to nowhere' crosses over the top. Notice the matrix sign with flashing yellow lights and a 40 advisory speed limit. Same view but without traffic! The lights are signed out of use - and were being worked on by a Siemens engineer. Large "Crossing closed" signs are blocking pedestrians' access to the crossing - but don't appear to make much difference! Close-up of the signs where the exits split. Although it's still only motorway traffic at this point, the signposting is black-on-white with blue borders, for local directions only. The black on yellow signs are diversions used during works on the motorway. In this case, the diversion is a semi-permanant division between mainline traffic and traffic joining at junction 20. 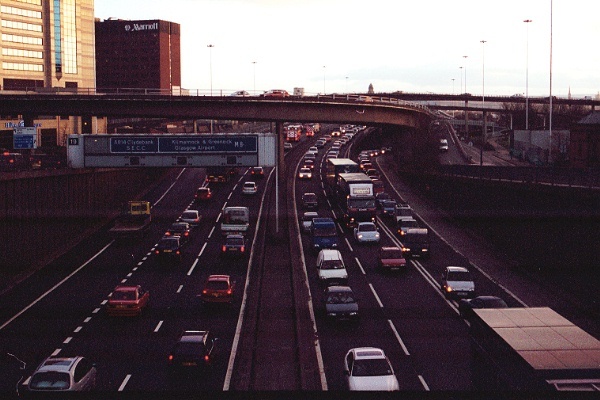 The joining traffic is forced to leave at junction 19 and here at junction 18. Traffic wishing to continue on the motorway must divert via the A804 at Charing Cross and then rejoin. 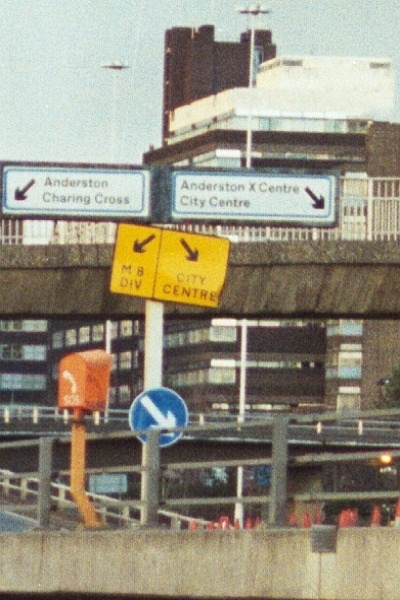 The 'keep right' sign is actually on the gore, and must be ignored by all traffic on the Anderston branch. The orange box is a standard motorway emergency telephone. 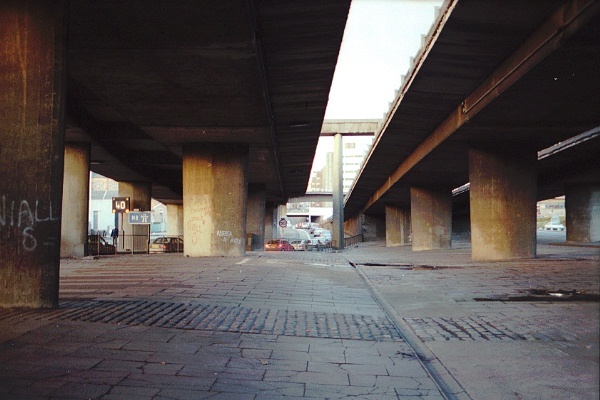 Underneath the M8 J18 exit, looking north. 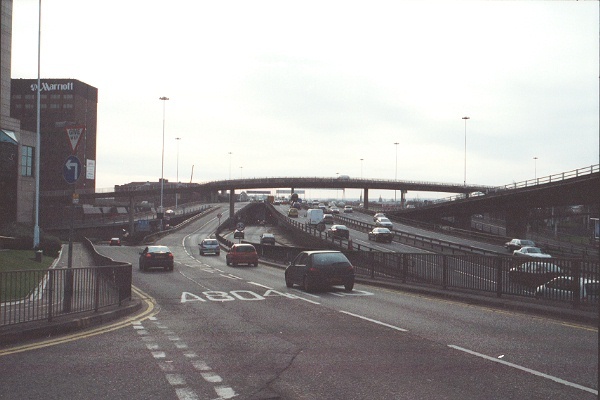 The double exit ramp is on the left, and the main carriageways on the right, with traffic from the A804 climbing up between them to join the motorway. The single pillar in the middle is for the 'bridge to nowhere'. One of the wierdest sights at J19/J18 is this exit ramp disappearing eastwards between buildings - but still at second floor level! 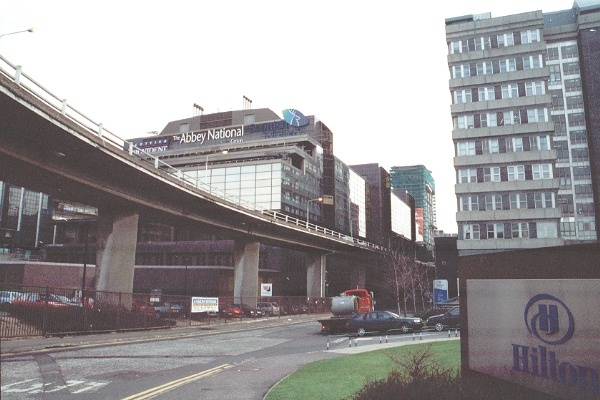 The ground rises very steeply just beyond the Abbey National building, and the ramp meets surface level without descending. 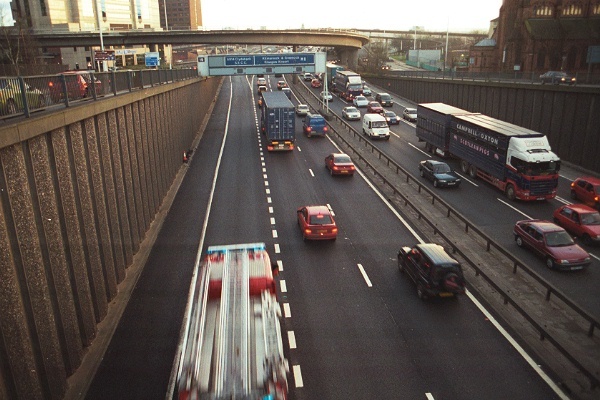 A feature of the M8 through Glasgow is that all of the ramps are wide enough for two lanes, although many are marked out with just one traffic lane plus a hard shoulder. Here, looking south along the A804 towards J19, with the motorway climbing out on the right, two slip roads, each marked with one lane, climb up to join it, with the ramp from the eastbound A814 crossing from right to left. 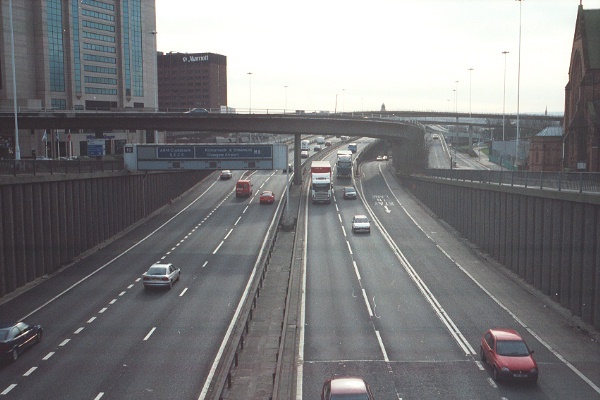 The two-lane motorway thus gains three additional lanes before the Kingston bridge. Looking south along the A804. North of J19, the M8 is in a deep cut. There are only two through lanes beyond J19, but the Fire Engine has no hesitation in using the auxiliary lane to get past slower traffic. There's also an auxilliary lane northbound from this junction. The double white lines to keep traffic from moving right too early are widely ignored. Another view without the traffic, and "Stay in lane" painted on the slip road from the A804.